... according to estimates of experts. This means there is no necessity for creating complex 3D models. It is very easy to deduce the CNC code from a simply creatable 2D geometry and the user is able to produce geometry in short time and is supported by an userfriendly CAM program. Less complexity means less loss of time and this results in cost saving. In any case, it should be ensured that the simulation of the CNC program should work in 3D-mode, because safety also means cost saving. Make best use of the program anddo any kind of jobs, e.g. creating drawings in 2D up to data transfer to the FILOU NC control unit. Even existing drawings can be revised and processedlater on. The same applies to already existing CNC programs which can be simulated in 3D by FILOU NC. Now, anything can be passed on to the control unit in FILOU NC, beginning with drawings and sketches upto data transfer. However, it is not essential to do so. There is still the possibility to import DXF files or – and now this is new – finished CNC programs can be imported and simulated later on. Import your geometry (AutoCAD-DXF, HPGL, MegaCAD-CDL, G-Code). You can preprocess the imported geometry by special functions or issuea new drawing via available CAD functions. It is very simple to create your NC program out of the geometry. Contours, pockets, circular pockets, milling any kind of texts, free-hand milling, drilling jobs with optimization of distances, and if desired, machine-specific cycles. An additional feature is a tool-management with analysis of the cutting data. Due to a modern CNC editor with integrated operating plan it is possible to process an almost unlimited number of CNC files. Besides the conventional commands there are also CNC specific functions. The integrated operating plan guarantuees an easy processing of more complex CNC files. The backplot is responsible for displaying tool distances as 3D graphics and the finished program is interpreted (G-Code, ISEL NCP HPGL, etc.). Even programs which have not been created with FILOU NC can be processed in the backplot. There is an associative link between backplot and editor. Please note, that even CNC programs (max. 3 simultaneously running axes) which have not been created with FILOU NC can be simulated in 3D. And that‘s quite easy: analysing the NC code, defining the unmachined part, assigning the tool, starting simulation and... ready ! By using the integrated macro programming it is possible to write and define own CAM macros, and to adapt the postprocessor individually to nearly any kind of control units and to equip it with particular functions as required. For cooperating with WinPC-NC the delivered package includes 3 postprocessors which are ready for use. Please note, that much more postprocessors are included in the OPEN version. Individual postprocessors with machine-specific cycles can be provided on request. You can produce CNC programs for the stepper motor controller WinPC-NC in a minimum of time and it doesn‘t matter which kind of format yourequire – DIN/ISO or HPGL. Transfer the result directly to WinPC-NC in the background without saving and re-loading files. Optimize milling distances of your HPGL files and save time from up to 60 % or more by removing unnecessary no-load traversings with FILOU NC. That‘s a kind of NC programming of pleasurable experience. ...you can also save costs concerning price ! Draw the workpiece according to the final dimensionwithout considering the final size of the milling tool. FILOU NC calculates automatically the path correction for each used milling tool. Mill any kind of circular pockets or cones by usinga Helix milling path– no problem for FILOU NC! Simulate your programs in 3D. can be saved with geometry and NC code as a project. You can immediately simulate and check the CNC code. This procedure is easier and time-saving compared to test runs of the machine without workpiece. Of course, it is also possible to simulate the existing CNC programs, e. g. 3D programs with max. three simultaneously running axes (XYZ) from DeskProto. The combination of both programs provides all necessary functions for an effective and fast generation of programs and an production of inidividual parts. FILOU NC for WinPC-NC and its well-matched range of functions is comparably cheap and you can benefit from additional cost savings by ordering WinPC-NC at the same time or by a followup order within 30 days from receiving WinPC-NC. 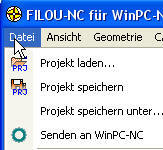 A 30-day test version of FILOU NC for WinPC-NC together with a basic introductory manual is provided on each CD of WinPC-NC, ready for immediate installation and testing phase. Of course, we can also supply upgrades of previous FILOU NC versions.